Daimler patent threatened in the U.S.
BlueTec versions of Mercedes vehicles have low emissions of nitrogen oxides. 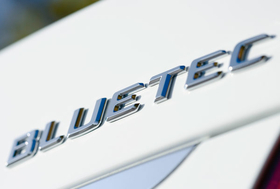 STUTTGART -- Daimler could lose its U.S. patent for the BlueTec exhaust gas treatment process, just as it has in Europe. Catalytic converter manufacturer Umicore has not yet decided whether to challenge Daimler's patent in the U.S. "We are basically reserving that right," a spokesman for the company told sister publication Automobilwoche. Complaints from Umicore finally killed Daimler's European patent (EP 1054 722 B1). In early June, the European patent office decided the question against Daimler. The issue had been in dispute for years. This means the technology is freely available to anyone, at least in Europe. According to parties involved in the case, nearly every vehicle manufacturer in the world sent their patent specialists to hearings on the issue. The importance of SCRT, or selective catalytic reduction technology, is immense for the entire industry: In combination with particulate filters, exhaust treatments are considered a key technology for cars and commercial vehicles alike. This is true both in Europe, with its Euro 6 emissions standard, and in the United States. That's why Daimler was looking forward to high license fees for the use of the technology. It uses urea, an organic chemical, to reduce nitrogen oxides in vehicle emissions. "We saw our competitive position in this important environmental market impaired," a source at Umicore said. Uncertainties over possible patent infringements and licensing payments hindered the company's efforts to market high-performance components for exhaust gas treatment, the source said. The tug of war over the technology's proprietary rights has been both explosive and grotesque. Umicore rival Johnson Matthey, a British firm, filed the patent in 1999. Daimler and Umicore filed a challenge in 2002. Later the Stuttgart automaker and Johnson Matthey came to an agreement, becoming co-owners of the patent. The result: Umicore, which originally wanted to take action against a competitor, suddenly saw itself in a fight with a major customer. For years, the Hanau company has been a main supplier of catalytic converters to the Mercedes-Benz car business and a development partner for nitrogen oxide absorbers for exhaust gas treatments in lean engines. It even supplied catalytic converters for the BlueTec systems themselves. There's still more to the story: the European patent office based its decision on the argument that the SCRT solution was already the state of technology at the time of the patent filing. In the process, an article in the trade journal Der Nahverkehr played an important role. In the piece, the inventor of the system wrote about various emissions solutions such as SCRT. This was before the patent filing. "A mortal sin in patent law," said one attorney who specializes in the field. Another stumbling block: Only the exact configuration of the individual components were patented. In this case, the threshold for inventiveness was not reached, according to the board of appeal. It's still not clear whether Daimler will try to exact licensing fees in the United States at least or will avoid further confrontation. Meanwhile, the BlueTec brand name is not affected by the patent battle, since it's a general term for advanced diesel exhaust systems.